Buy the book! Now in its 3rd edition, the book is still availble at your local bookstore or online from Chapters.ca for the low price of $29.99. 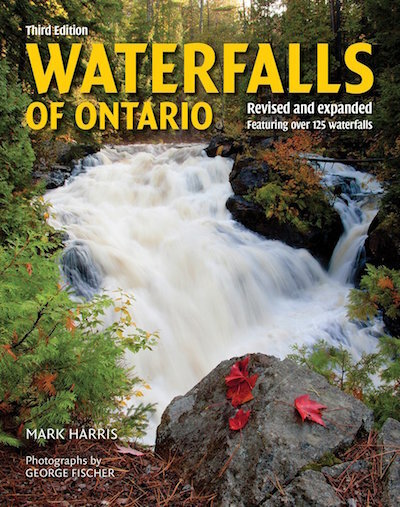 Get descriptions and directions to over 125 of Ontario's best waterfalls. Beautiful full-page colour photos by photographer George Fischer make this just as much a coffee table book as a guide book. Click the book for more information. Have photos to share? Looking for directions or a hiking buddy? Join the discussion on our Facebook group! With over 3000 members we usually have a few posts about Ontario waterfalls each day. This is a rather well known waterfall, if not necessarily that scenic. The falls is actually quite large when river flows are high, with a width of up to 50 meters and a height of 7 meters. The waterfall is located immediately beyond the bridge for Kawartha Lakes Rd 121 - the only bridge over the river. Some might argue that the bridge has ruined the view, but once again, I consider it to be a strong reminder about the important link between waterfalls and society. Between the falls and the locks, there is a small hydroelectric generating station. A good interpretive sign provides a useful overview of the generation process, complete with good diagrams and maps. The existing station first started generating electricity in 1997, and is currently rated at about 2.6 megawatts. Lock 34 of the Trent-Severn waterway is also located beside the falls. If you like this web site, you will love the published book! Buy it at your local bookstore, or online at Chapters. Get descriptions and directions for over 125 of the best waterfalls in Ontario. Each is illustrated by full-page colour photos by professional photographer, George Fischer. The 262-page third edition was published by Firefly Books in 2018, and is still available for the low price of $29.99. Mark Harris hereby notifies you that he makes no guarantee that it is safe to visit any waterfall identified on this site. Conditions can change. Always use caution. Mark Harris hereby notifies you that this web site does not give you permission to visit this waterfall or to trespass. The northern and eastern portions of the province (as well as the Bruce Peninsula) are "bear territory". Be prepared! Mark Harris hereby notifies you that he makes no guarantee that the directions provided on this web site are correct, safe and/or legal. You are responsible for yourself! Visiting waterfalls can be dangerous. Mark Harris hereby notifies you that he takes no responsibilty for your safety. Inclusion of a waterfall on this site does not guarantee that it is legal to visit. A Waterfallsofontario.com web page has been viewed this many times since May 29, 2012. Copyright Mark Harris June, 2018. London, Ontario. With lots of help from visitors like you! Online since 1999. In print, 2003, 2011, 2018.